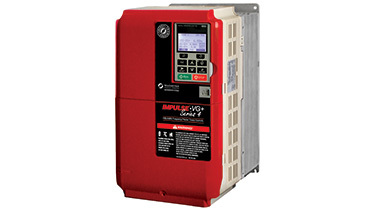 VFD's designed for cranes and hoists! 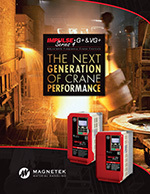 Magnetek's IMPULSE brand of drives for AC motor control used in overhead cranes, hoists, and material handling applications. 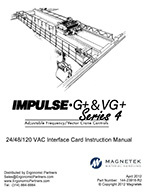 Magnetek's selection of Adjustable Frequency Drives are designed with versatility, reliability, and safety in mind. 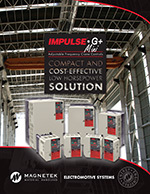 These AC drives range from basic, compact low cost units to advanced variable speed drive units featuring Magnetek's exclusive overhead bridge crane and hoist software. 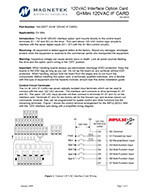 Typical VFD configuration settings for most applications consists of: Soft Start — Provides adjustable gradually increased motor acceleration up to a single speed (1 step pendant buttons). 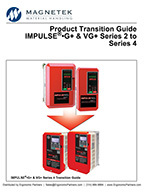 Multi-Speed — Provides up to 5 "repeatable" speeds with adjustable acceleration and deceleration between speeds; typically uses pendant button steps corresponding to the number of speeds the VFD provides (e.g. 3 speeds equals 3 step buttons). 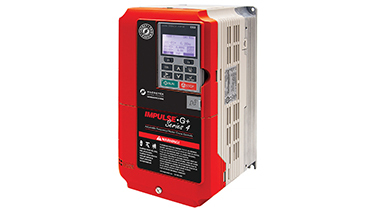 Infinitely Variable — Provides the ability to select any speed that the operator accelerates or decelerates to. 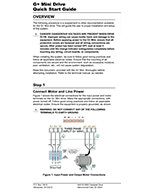 1st step / 1st button detent: Motor holds a constant speed reached by accelerating or decelerating. A motor starting from stop will accelerate to the slowest speed. 2nd step / 2nd button detent: Motor holds a constant speed reached by accelerating or decelerating. 3rd step / Fully depressed button: Motor accelerates and stops accelerating once the highest speed is reached (typically -hoists only use a third step). Release pendant button: For hoists the motor stops immediately and the brake is applied. For the crane bridge and hoist trolley the motor decelerates slowly until it stops. 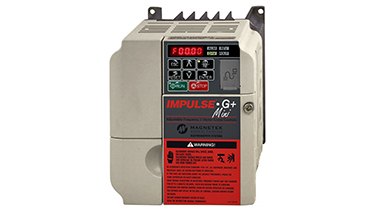 The IMPULSE G+ Mini from Magnetek is their most economical, reliable and simplest adjustable frequency drive to install, setup and use. It features user-friendly factory-default standard programming modes for basic crane motor control applications and advanced programming modes for high performance material handling environments. 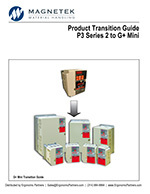 The G+ Mini drive is designed with an expanded AC motor horsepower range, small mounting footprint, 50Hz voltage compatibility, overload detection, and optional flat heat sink. 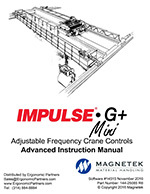 All of these features make the IMPULSE G+ Mini the product of choice for your overhead crane, hoist or material handling needs. *Horsepower is provided for reference only. Drives should be sized by motor Full Load Amperage (FLA). 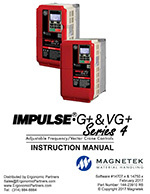 Magnetek's IMPULSE G+ and VG+ Series 4 drives are designed "from square one" for material handling applications and provide the most crane-specific capabilities far beyond any other general purpose drive's functionality. These drives can be used as an open-loop vector or V/F crane control for traverse motions or mechanical load brake hoists. 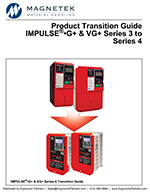 With industry-leading safety and unmatched performance features combined with superior crane-specific control; the G+ or VG+ Series 4 drives are the ideal choice for your material handling systems. *Horsepower is provided for reference only. Drives should be sized by motor Full Load Amps (FLA). 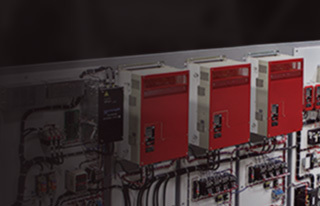 Whether you need variable frequency motor control for your smallest hoist or largest overhead bridge crane Ergonomic Partners can provide a solution. Ergonomic Partners serves clients from coast to coast, Canada, Mexico and especially focused in the states of Missouri, Illinois, Indiana, Kansas, Arkansas, Mississippi, Nebraska, Tennessee, Kentucky, Iowa, and Oklahoma.